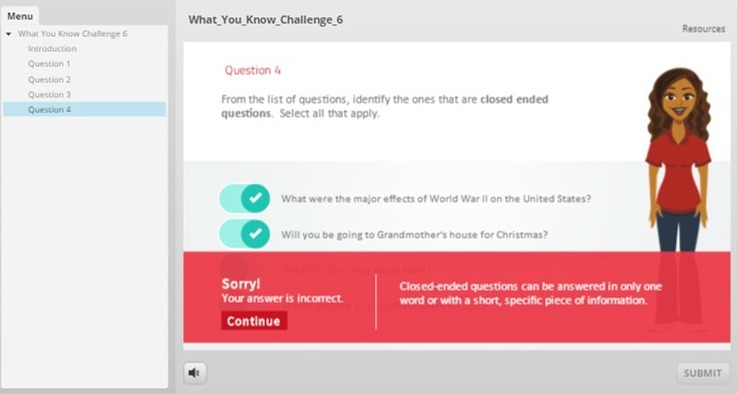 Purpose: Enhanced the in-classroom learning experience by adding online interactive challenges at the end of each class. This game-like learning assessment kept the learner engaged while testing their knowledge gained on the topics covered in class that day. Completing these challenges not only counted towards a participation grade but it also became a fun competition to see who earned the highest score at the end of the 7 week class. The top 2 highest scores won a prize. Learner Audience: Young adults (aged 18-24) who are participating in a 21 week workforce development training program designed to teach them the necessary business skills needed for their internship assignment with corporate partners. Instructional design –Created the concept, content and visual elements for the game-like learning assessment based on the in-classroom course content. Designed the entire curriculum for the in-class training. Project management – created project plan and ensured that the enhanced learning materials launched in time for the next class starting in Fall 2017. Tests the learner's knowledge based on the content taught in class and provides immediate feedback. Using visual elements like color, fonts, characters, expression, poses along with tracking points to keep the learner interested and motivated to earn a perfect score. Designed an interactive curriculum for instructor-led training which seamlessly flowed into creating blended learning content for continued online learning.